We provide telescopic shafts for any driver heads...yours, ours, or from any number of foundry sources. A modern driver head with our telescopic shaft is about 45" long (114cm), depending on the head since club-length includes the head all the way to the bottom of the heel. Your choice depends on your purpose. Do you ONLY want to get maximum drives off the tee? Or do you want a head that will bomb it off the tee AND be great for long fairway and rough shots too? Modern large-size driver heads are designed for maximum distance off the tee. The center of gravity is too high to be used off the fairway with any consistency. If maximum distance off the tee is your only goal, a driver head is what you want. Of course, you are not limited to just one "long" club. You can get a telescopic driver dedicated for driving, and then a telescopic 3-wood and/or a 3-iron hybrid for your long fairway shots. It all boils down to how many clubs you want to carry. When I travel and am not sure if I'll be able to play golf, I only take my Whole-In-One Adjustable. If I'm sure I'll get to play once or twice, I'll also take my telescopic T&F Driver and putter. If it is a dedicated golf trip, I'll add my telescopic 11-degree BigStik driver, 3-iron hybrid, and 56-degree sand wedge. They all fit in my roller bag and I NEVER pay extra for checking a golf bag! If you want to be able to hit it off the tee AND fairway, we recommend our Tee and Fairway (T&F) Driver. This is our most popular driver option. It is essentially a "3-wood on a driver-length shaft," or as some of our customers have refer to it, "A 3-wood on steroids!" The goal of this club is to give you portability (collapses to just 26 inches (66cm), but greater distance off the tee and longer second shots than the Whole-In-One Adjustable can produce with its shorter shaft length. The standard extended length of the T&F Driver is 44" (111.75cm) while the Adjustable is only 38.5" (97.8cm). So the T&F Driver generates a lot more club-head speed. **We can make the T&F Driver shorter if you prefer. For every extended inch shorter, it collapses to 1/2" shorter. You can choose the length when you place your order. The driver collapses to the longest length of any of the traditional clubs (not including chest putters or the giant BIG STIK driver). So if you want to travel with it, you will want to use a suit case that can accommodate the collapsed GREEN length shown below. All other telescopic clubs such as the Whole-In-One Adjustable, hybrids, wedges, and traditional length putters collapse to a shorter length so they will easily fit in any case that accommodates the TF Driver. When you measure your suit case, remember that you can fit the collapsed driver from a lower corner to an opposite upper corner which maximizes the available space. You can then fit your clothes around the shaft. If your suitcase is too small, you can get "roller-duffels" that will easily hold your clubs and clothes with room to spare. They are very inexpensive...shown here. A 44 inch telescopic driver shaft with a 3-wood is fairly flexible because a 3-wood head is heavier than a driver head. We can make it stiffer by cutting length off the tip, but that also reduces the potential club head speed. Also, the telescopic carbon steel shaft is heavier than a graphite shaft. So a telescopic driver, no matter which head you choose, doesn’t feel the same as a graphite-shafted driver. Unfortunately, we can’t make graphite shafts telescopic because their wall-thickness is too great. Given those considerations, most of our customers don't think of a telescopic driver as trying to match the feel and performance of their graphite shafted driver. At the same time, some of our customers hit this club farther than their expensive modern titanium-graphite name brand drivers. It is a matter of matching the swing to the club. "I can't believe how well I hit your TF Driver off the tee and fairway. It is a little heavier than my Callaway driver, but it just works for me. I bought it to take on trips, but now I have it in my bag and find myself using it off the tee more than my driver because I hit it just as far and it is more consistent. Now what am I supposed to do with my expensive driver?" It is definitely a club that you can hit farther than the 38.5 inch Adjustable Loft Whole-In-One. It is longer off the tee, off the fairway, and out of the rough. But it isn't necessarily just like your driver which is a tool that is designed just for driving. With these variables in mind, we aren't able to offer flex options with the telescopic drivers. 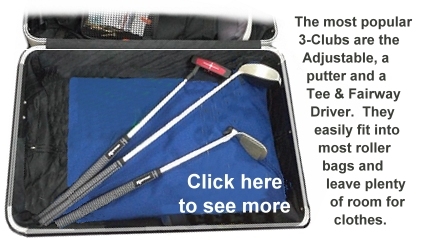 Click here or on the picture to the right to see the best way to fit our telescopic clubs into an airline-checkable travel bag. We also offer some alternate heads for a small upgrade price described in the Ordering section below. For maximum driving distance, you can select our 11, 13, or 15 degree titanium BigStik or 13 or 15 degree BigJane heads described here. These heads are 400cc's with a high center of gravity so they produce long arcing drives with long roll-out. As such, they cannot be used off the fairway...off the tee only. These heads are legally conforming to the rules of golf. We can even install our Giant Double-Size BIG STIK head. It is not legal for tournament play, but it can really smash long drives. It definitely cannot be used off the fairway or other tight lies. Prices for alternative heads are shown below. If we don't have the head you want in stock, we can fit our telescopic shaft to any head style you want. You can supply a head (we can remove the head from your shaft for a small fee if you need us to do that), or we can match what you want from our foundry suppliers. Click here to read more about custom telescopic clubs. Note from Steve Divnick: While we receive a lot of compliments like this, not everyone will hit farther than their expensive graphite-shafted driver. But for the average golfer who struggles to get high arcing shots off the tee, this “3-Wood on steroids” will give you consistent distance that is hard to achieve with lower-lofted drivers. For those who are good off the tee, even scratch players, you will love how you can still reach par-5’s in 2 strokes with our telescopic TF Driver. I personally guarantee your satisfaction or your money back. Get a $50 discount if ordered before the end of April, plus an additional 10% if you order 3 or more of ANY clubs. 400cc BigStik heads are normally a $50 upgrade, available for $39 if ordered this month in 11, 13, and 15 degrees. Right hand only. Ask about available leftie driver heads. BigJanes are available for just $25 this month in 13 and 15 degrees. Right or Left Handed. Giant BIG STIK's are an additional $150. These are the heads we put on the World's Longest & Largest Drivers. Head Covers: The T&F Driver head is a beautiful painted head. So most customers want to cover it to protect it. Many want to use their own 3-wood head-covers, so we don't automatically include one. 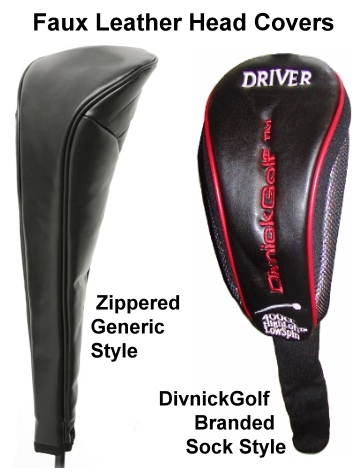 We offer a high quality faux-leather easy-on-easy-off zippered head cover shown here for an additional $10. Timing: We can usually ship within 1 business day. We will contact you immediately after receiving your order if there will be any delays.